Just a thought, for all the other doting parents out there. This made me chuckle when someone posted it on Facebook. Fair point, it must be really annoying but we just can't help it can we! When you post pictures of your kids on Facebook you are probably irritating the shiatsu out of someone else. Aargh! Good old social media etiquette. 1) Try and keep a one picture a week limit, or something like that. Works for me. 2) Everyone else can go to hell! Aww. Look at iz little blue shoez! LOL! -We all know one of these Rambo parents on Facebook, don't we? I admire their tenacity and the way that DO YOU PEOPLE NOT REALISE THAT 'LIKING' THEIR PICTURE ONLY ENCOURAGES THEM TO POST MORE PICTURES OF THEIR 'CHEEKY LITTLE MONKEY' TODAY??! 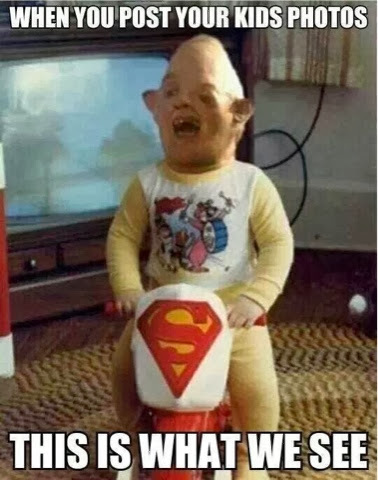 P.S for anyone that doesn't know, the picture is of Sloth from the Goonies. A legendary film from the 80s. Much to my horror when I found out, my wife hasn't seen it. But that's another story. I may have to entitle it 'iconic 80s films my wife has not seen'. Watch this space. There definitely needs to be a list of say... 100 classic GOOD films from the 80's & 90's that your future spouse must watch before you exchange rings. We're not married but I'm educating him. Godfather trilogy is currently next on the list.